We posted this snapshot of Private George Washington Hill this week on our social media channels. Hill did not survive the war, but was killed at the Battle of Arleux barely two weeks after the victory at Vimy Ridge. Hill’s story got me to thinking about Arleux and the battle there, which is overshadowed almost completely by Vimy and to some extents the later Canadian engagement at Hill 70 in the summer of 1917. I wanted to talk a little more today about Hill and the battle where he died. George Washington Hill was born in Seattle in 1892 and immigrated with his family to Alberta sometime before 1908. 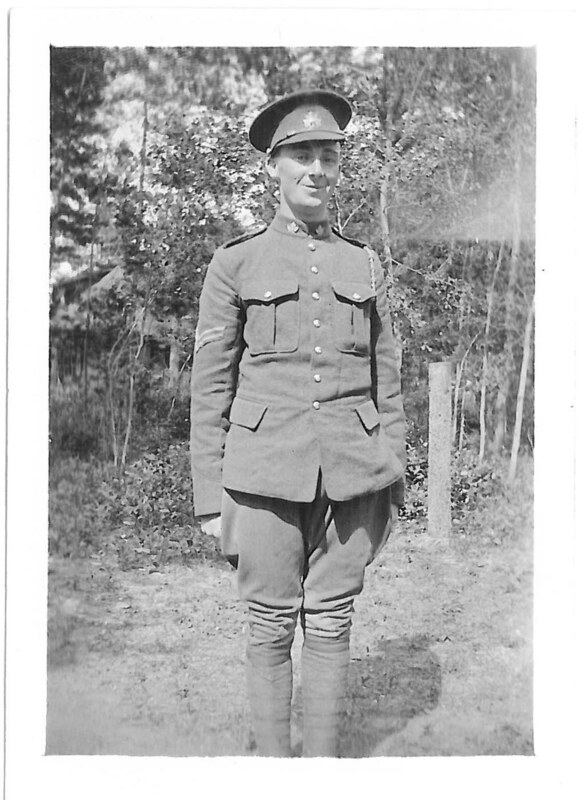 The family settled outside Red Deer and Hill worked on the family farm until he enlisted in 1915 with the 89th Overseas Battalion. Like many other battalions raised in 1916, the 89th was broken up for reinforcements when it arrived in England and Private Hill was sent as part of the reserves to the 10th Battalion, arriving in France in August 1916. The 10th Battalion, known as the Fighting Tenth, was one of the first battalions raised in Canada after the outbreak of the war and was part of the 1 Division. The battalion had fought in almost every battle that the Canadians engaged in during the war; shortly after his arrival Hill would likely have gone into action with the battalion at the Somme, fighting at Thiepval and in defensive actions around Boiselle. He was lucky enough to survive the battle at Vimy, where the 10th Battalion sustained heavy casualties and finished the day with only one uninjured officer. The Arleux Loop, a complicated trench system constructed around the village of Arleux-en-Gohelle, lay beyond the ridge at Vimy. The Canadian Corps descended the eastern side the ridge in the middle of April under well aimed enemy fire and almost constant rain. The battle for Arleux took place after the first British attacks on the area, known as the Second Battle of the Scarpe, that took place starting 23 April. The 10th Battalion was one of three from the 1st Division that would attack the area around the village in a night operation on 27-28 April, with the 25th Battalion in support. Their objective was a difficult one. The village was heavily fortified and, like at Courcelette, if the attackers succeeded they would have to defend against numerous German counter attacks. Private Hill and the 10th Battalion went over the top at 4:25 AM under a heavy Canadian artillery barrage, under total darkness. It is difficult to pinpoint when Private Hill fell; the 10th Battalion faced extremely heavy German machine gun fire that was accurate, despite the darkness, and many were killed or wounded in the first minutes of the battle. If he survived the first attack, the 10th still had to push its way through the lines surrounding the village to the centre, which they did with the 8th Battalion (Little Black Devils). Either way, Private Hill was one of the 10th Battalion’s 103 soldiers killed during the attack. He was buried at Willerval, but his grave was later lost. Private Hill’s name appears on the Vimy Memorial with 11 000 other Canadians dead in France with no known grave. My great-grandfather, Pvt John William Cripps, of Moncton, NB, born in Portsmouth, England was killed in that same battle. Thank you for sharing Judy. Many people forget that the time after Vimy was equally dangerous for those who survived it.